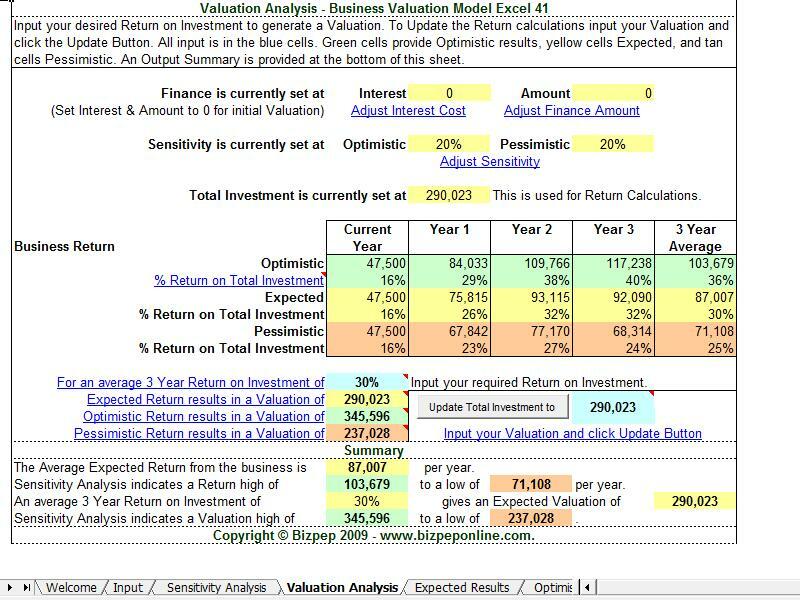 The Business Valuation Model is software designed to provide an economical, efficient and effective business valuation. It combines relative indicators for future performance with basic financial data to value a business. By applying your intuitive business and market knowledge a 3 year performance forecast with sensitivity analysis, investment return, and a business valuation is calculated. combine indicators for future performance with financial data to value business. Input should be based on your subjective views. These are translated into quantifiable values for model operation. There is no need to provide "perfect" answers. Use your industry knowledge to make informed estimates. The goal is to provide a streamline tool to indicate possible outcomes. Qweas is providing links to Business Valuation Model Excel 41 as a courtesy, and makes no representations regarding Business Valuation Model Excel or any other applications or any information related thereto. Any questions, complaints or claims regarding this application Business Valuation Model Excel 41 must be directed to the appropriate software vendor. You may click the publisher link of Business Valuation Model Excel on the top of this page to get more details about the vendor.